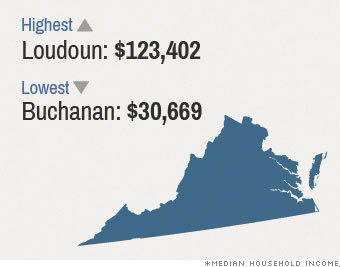 CNNMoney looks at the five states with the biggest differences in middle class incomes. Virginia is the most unequal when it comes to comparing median income by county. Loudoun, a wealthy county near Washington D.C., has four times the median income of Buchanan, a struggling county in the southwestern portion of the state. Home to Washington Dulles International Airport, Loudoun is one of the fastest growing counties in Virginia. Its population has surged 12% to nearly 350,000 between 2010 and 2013, compared to a 3% growth rate for the rest of the state. A desirable DC suburb, Loudoun has attracted a lot of wealthy, young families, said Hamilton Lombard, demographic researcher at the University of Virginia. The eastern part of the county is well-developed, while wealthy horse farms dot the western portion. Many Loudoun residents are employed by government contractors, particularly defense firms. Tech companies are also numerous. Its unemployment rate is only 4.4%, and its poverty rate only 4%, compared to 5.4% and 11.8%, respectively, for the state. Buchanan, on the other hand, was the state's bright shinning star a century ago when coal was king. The population of the county, which borders Kentucky and West Virginia, grew 1,500% between 1870 and World War II, Lombard said. The coal industry, as well as supporting businesses, drove much of the state's economy in the early part of the 20th century. But mining coal underground, as is done in the area, has fallen out of favor. Residents fled, leaving only about 24,000. Unemployment stands at 9.9%, while 23% of residents are in poverty. Data is from the U.S. Census Bureau's 3-year American Community Survey. It includes counties with more than 20,000 residents, and covers 2010-2012. Estimates are in 2013 dollars.